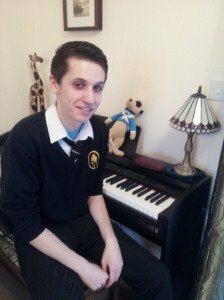 Declan is severely sight impaired but taught himself to play Clair de Lune by copying magnified internet pictures of a pianist’s hands. He really enjoyed it. So in 2011 his mother Claire applied to Amber for a grant to fund music lessons. Amber has continued its support and now, a couple of years later, Declan has a music GCSE and is ready to sit Grade IV theory. Declan is sixteen. He has just started his ‘A’ level studies in maths, accounting and psychology at West Nottinghamshire College. On those dark winter nights when he can’t easily go out to join in his friends’ activities, playing the piano has kept him going. It gives Declan a sense of achievement and personal confidence. And it makes him happy. Declan has played at school concerts and parents’ evenings. He would like to play in a group or band one day. 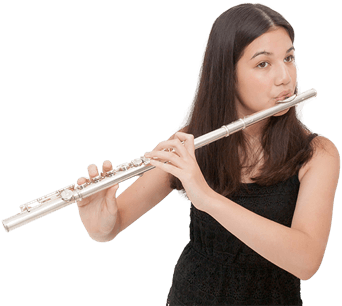 He’s helping others too… he has been encouraging younger pupils just starting their music studies. ‘His progress has been exemplary’, says his teacher Lesley Sylvester. And so say all of us.